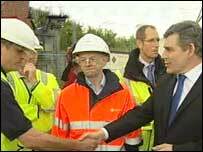 Prime Minister Gordon Brown has visited Gloucestershire for the second time in three days to see the devastation caused by the floods. After arriving at the Walham switching station in Gloucester, he thanked the fire and rescue staff saying: "You've done brilliantly, we're really proud." Mr Brown was met by Chief Constable Tim Brain and Gloucestershire County Council boss Peter Bungard. Earlier he announced £46m in aid for flood-stricken areas of England. The prime minister told emergency services workers: "You're a great team - people are very appreciative of what you've done - great spirit has been shown." He added: "We must make sure we do everything to ensure we don't have to go through this again." He then went on to pledge more would be done to get fresh water into the county. "Immediately I came here I saw we needed more bowsers and more regular filling of them and more tankers to fill them, and more bottled water," he said. "I appreciate the patience of the people in this area and the great community spirit but we know we've got to get the supplies stepped up. "Phone calls have been made and this is being dealt with immediately." Mr Brown said up to 900 more bowsers would be sent to the county and reiterated more tankers would be sent to ensure they are filled regularly. The prime minister was told 20 million litres of water had been pumped from the switching station overnight, bringing forward the schedule to get mains water back on by 24 hours. He was due to travel on to the flood-stricken town of Tewkesbury later on Wednesday.